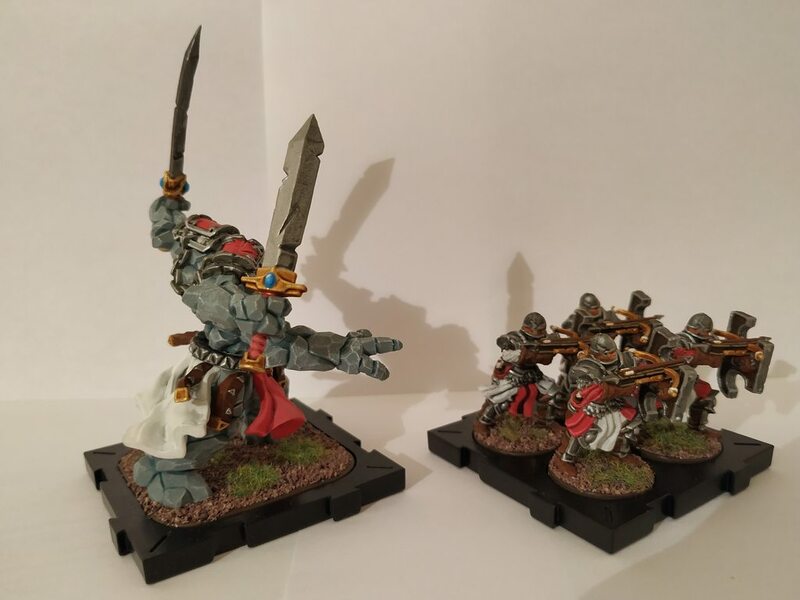 New to Runewars - Here are my first 3 minis! 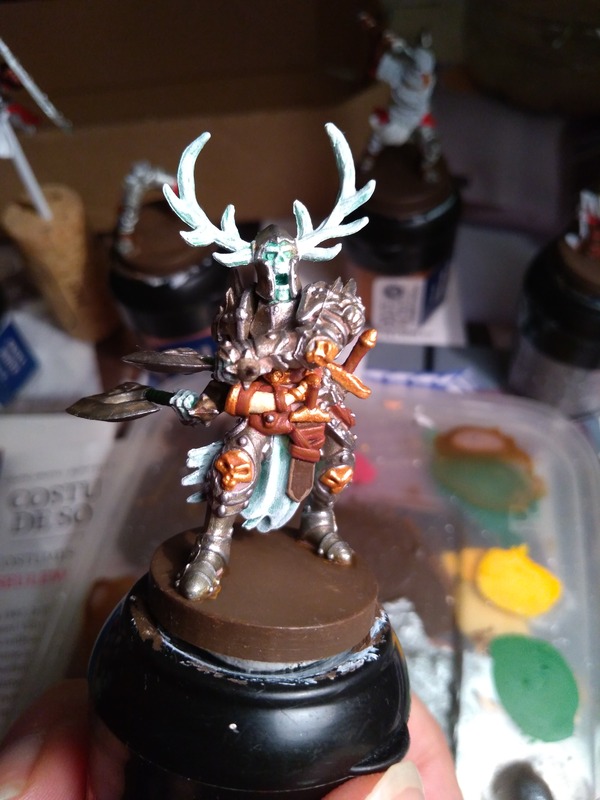 After years of hiatus, I have started painted minis again. 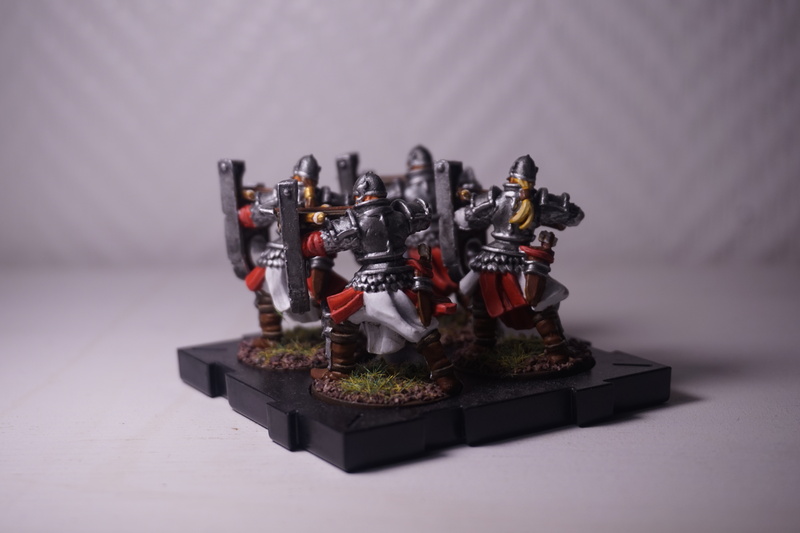 I started with my Memoir 44 and Cyclades minis, but quickly wanted to go back to something a little bigger and more detailed (I had started all the way back in the early 2000's with the Lord of the Rings Strategy Battle Game, when it was first released). I also wanted something with a simple ruleset so I could quickly teach friends and family to play with me, as I don't plan on playing this competitively. 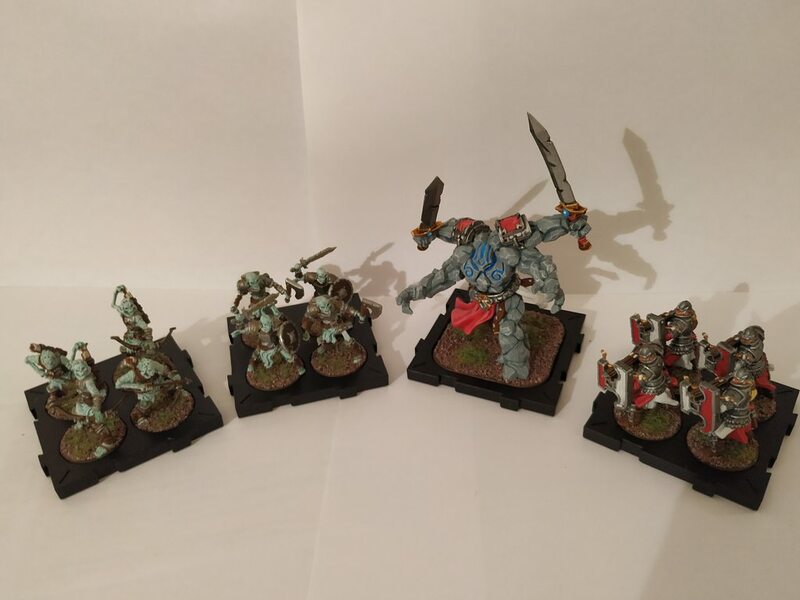 I thought about Bolt Action and SW:Legion but ultimately decided against those as Bolt Action is a little too complex, Legion still too expensive, and with the discontinuation of Runewars in French I was able to pick up the core set + 2 expansions (Heavy Crossbowmen and Death Knights) for less than a Legion core set. 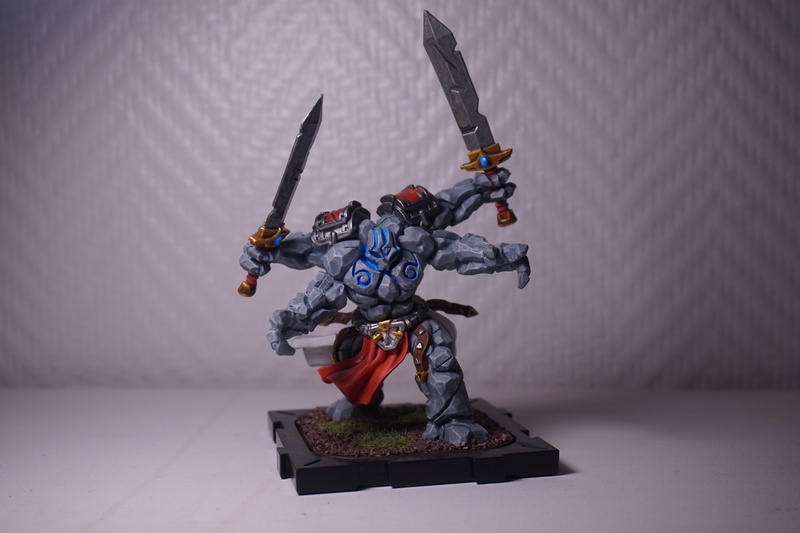 Plus, the Golem! 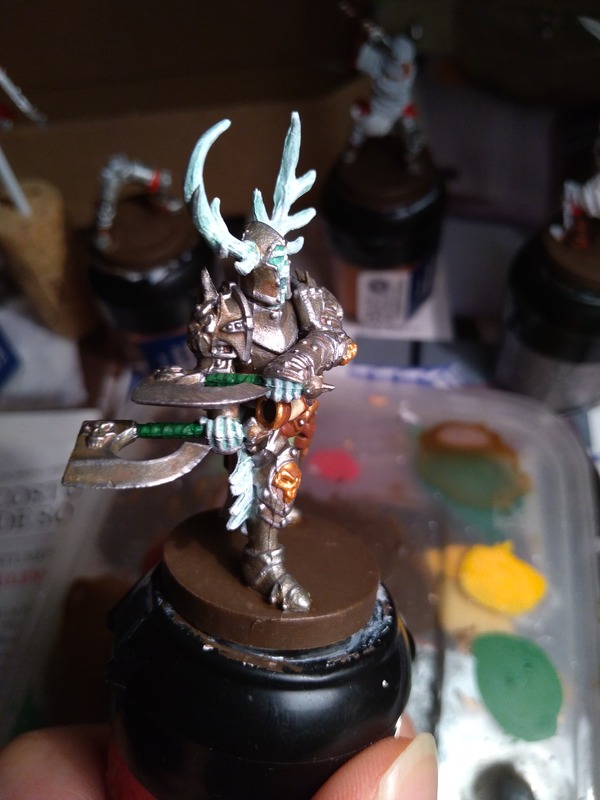 Anyway, I decided to paint my Daqan in a scheme somewhat inspired by Warhammer Fantasy imperials, and my Reanimates as some sort of wraiths clad in old rusty armour. 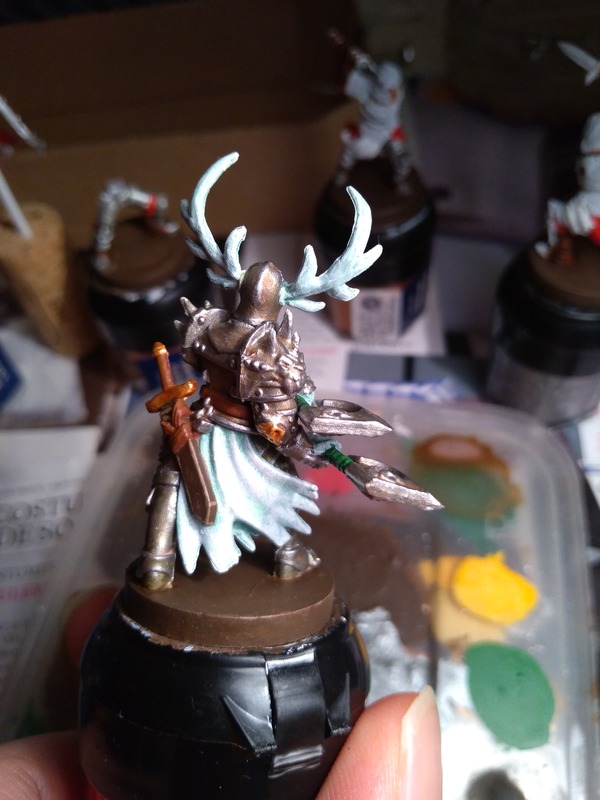 It's a very quick scheme to do: white base, green wash, white brushing, and then paint the armour and wood/leather bits. 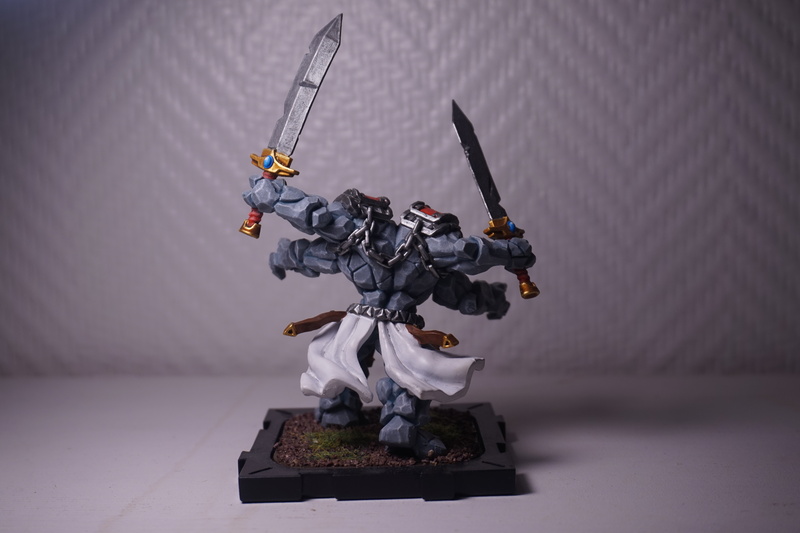 Still a lot to improve of course, and I won't be shading the fabric with black wash on my next Daqan minis like I've done here, it looks messy especially on the white. I'll just do some layering. 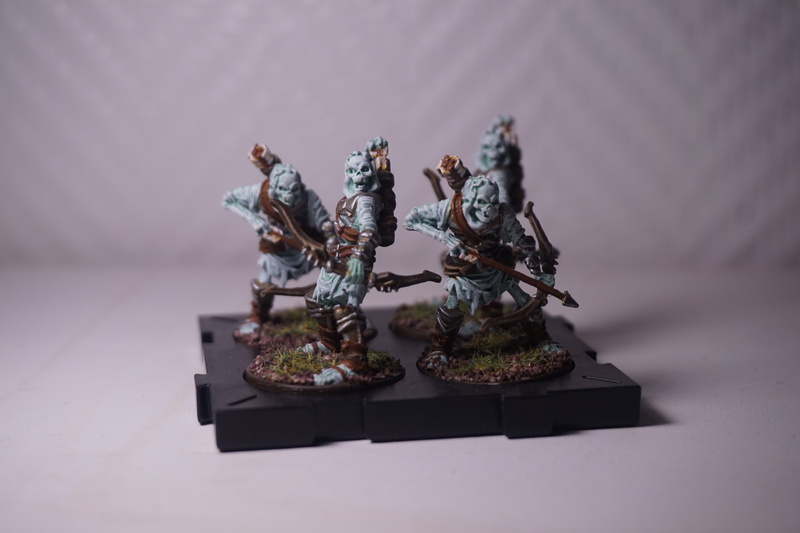 Bases are Army Painter Brown Battlegrounds left unpainted, and some static grass. I dig it! 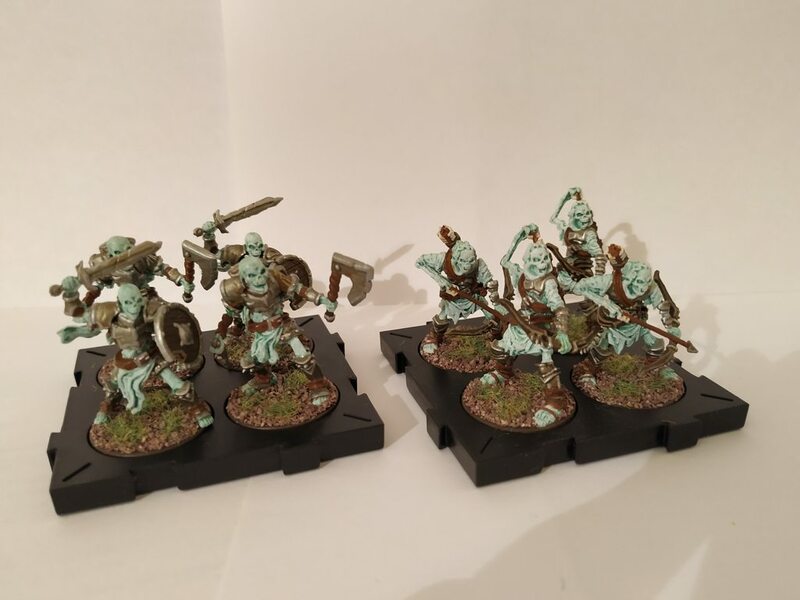 Having just finished my 10th tray of Reanimates, I can now see the value of choosing a simple paint scheme. I will say that my Reanimates were much easier than Berserkers. Your ghostly Reanimates look appropriately terrifying. Thanks! I must admit my choice of a ghostly scheme for the reanimates was partly because I like the look but in no small part because it would speed things up! Looking good. One thing you might consider with the ghost theme is painting the armor with really translucent paint. You can use inks or thin with water and binder. That way they end up looking partially 'ghostly' too with some of the base 'ghost' color showing through. Wow, I wish I was half as telented as you. Love the paint. 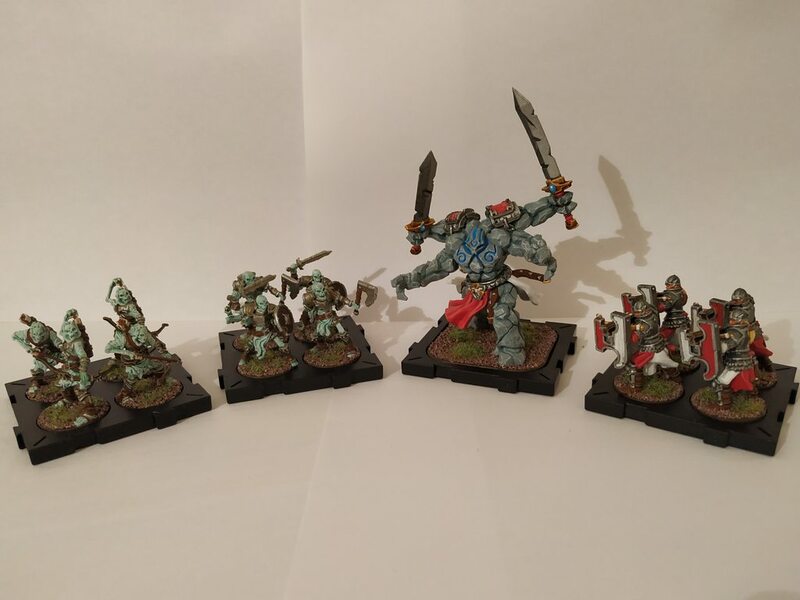 I have made some progress and finished the Golem and a tray each of Reanimates, Archers and Crossbowmen. 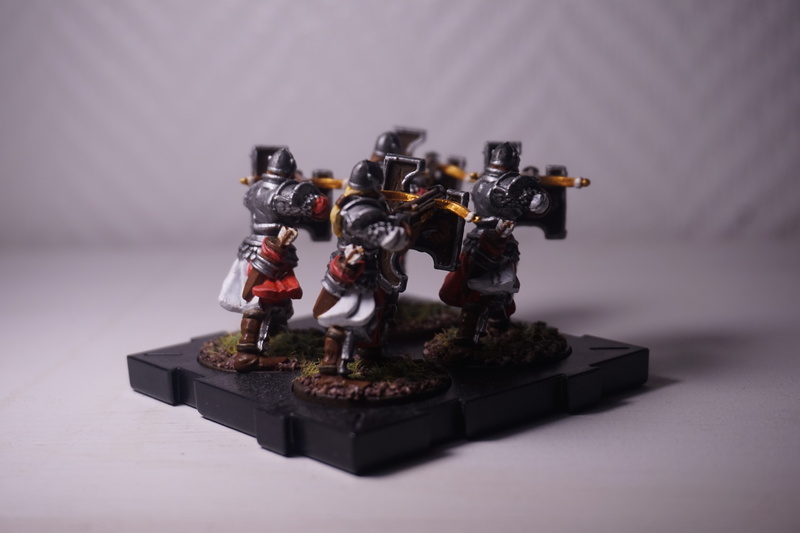 I've gone a bit lighter with the shading on the three other Crossbowmen and they came out much nicer. What do you think? Apologies for the warm colours, I'm not good at taking pictures. 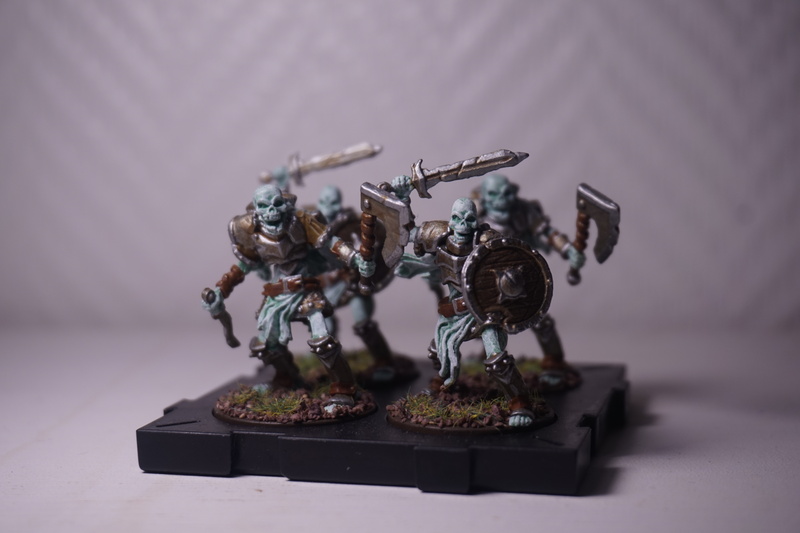 Damnit you have me considering changing my undead army to a ghost theme... Can't be that much trouble to strip and repaint 60 Reanimates and 30 archers... right? I hereby forfeit any and all accountability if the paint stripping goes poorly! ? 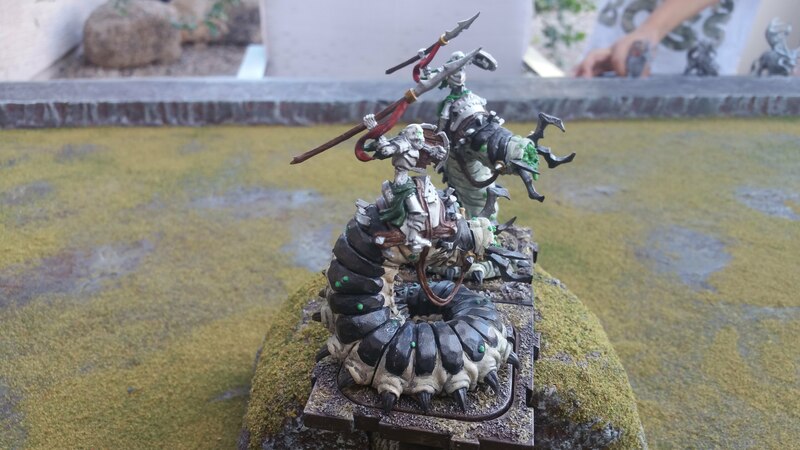 Actually I still have no idea how I'm going to paint my carrion lancer. 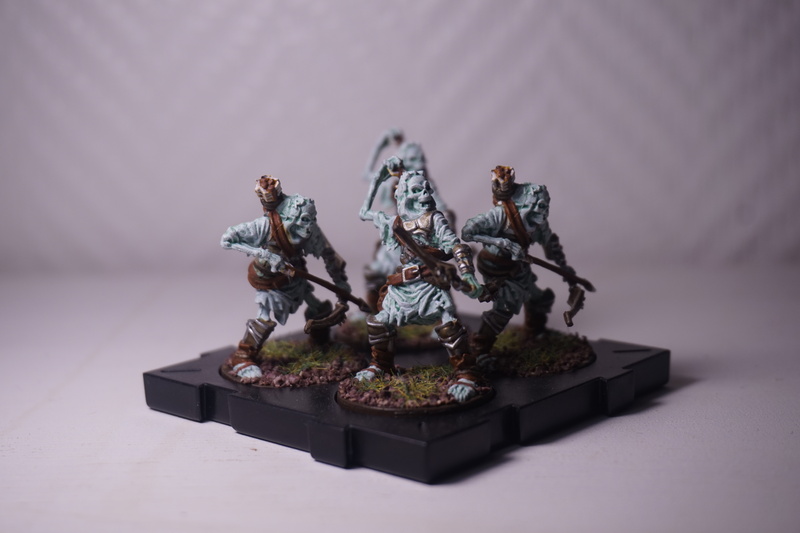 Since my reanimates are already green I'd want something else to contrast, but I don't have any purples and I don't want to mix paints as it's too hard to find the same colour again if I can't do it all at once. So I'm thinking some beiges and browns maybe, but I don't want it to be too dull. 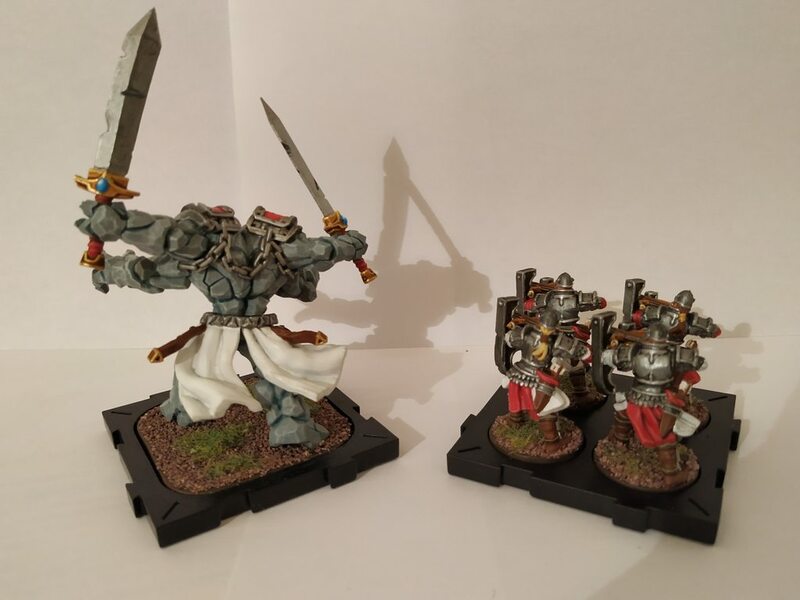 How did you paint yours? 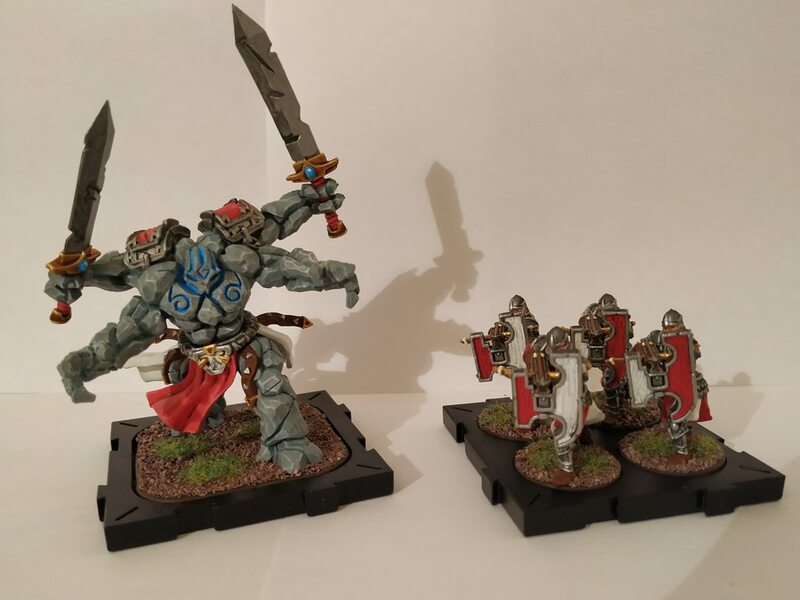 Don't have any pictures of my mediocre paint jobs on hand, but I'll post one when I get a chance... Been meaning to show off my new game board, so maybe I'll bust that out and take some pictures. 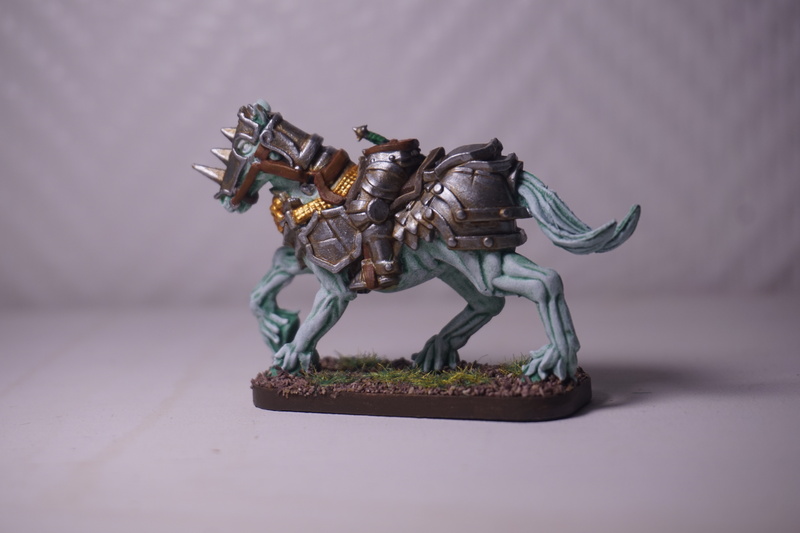 I'm not great at either painting or photography, but here is a look at them. 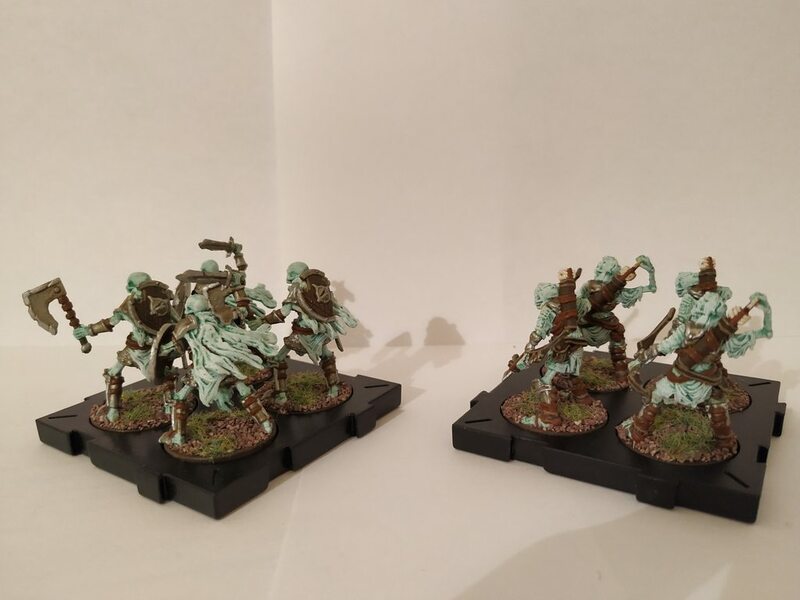 I went with a pretty plain look for all my undead, basically swapping the Waiqar purple for a dark green. 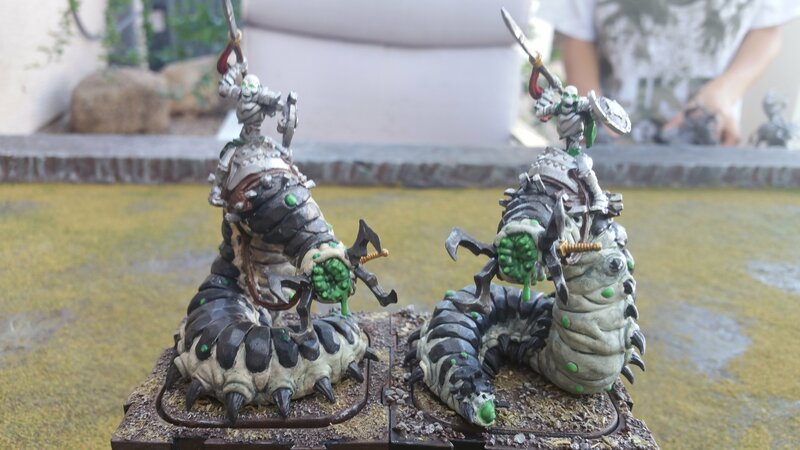 The worms are painted a maggoty flesh color with a metallic black carapace. Nicely done. I like them. Love the green dots on the shell... I should have done that with mine. 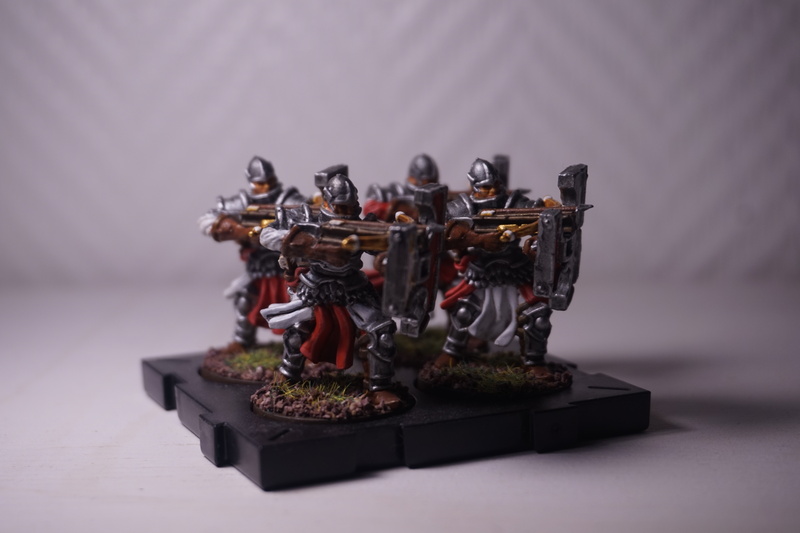 Your crossbowmen came out very nice. Very clean looking. The ghost reanimates look great too. I haven't put brush to any of my Waiqar yet. 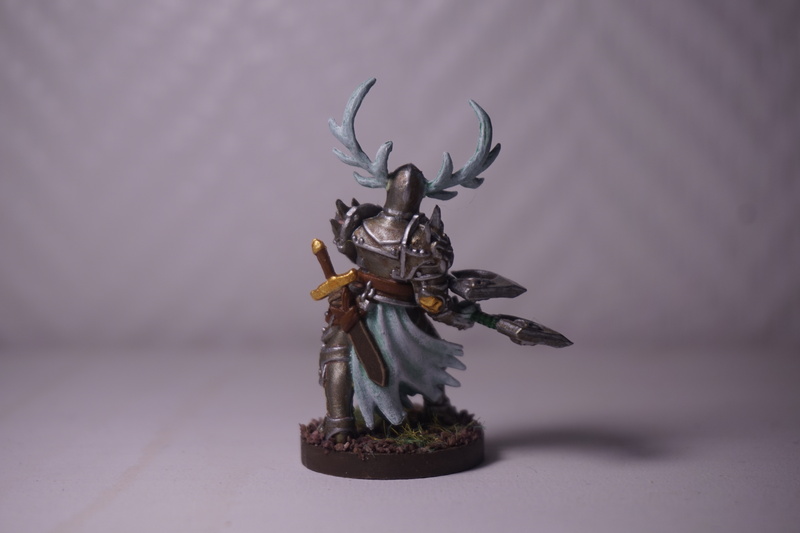 I think there's some serious value in painting them in a way that is simple to churn out a lot of them quickly. Great job! Thanks for the comments everyone ! 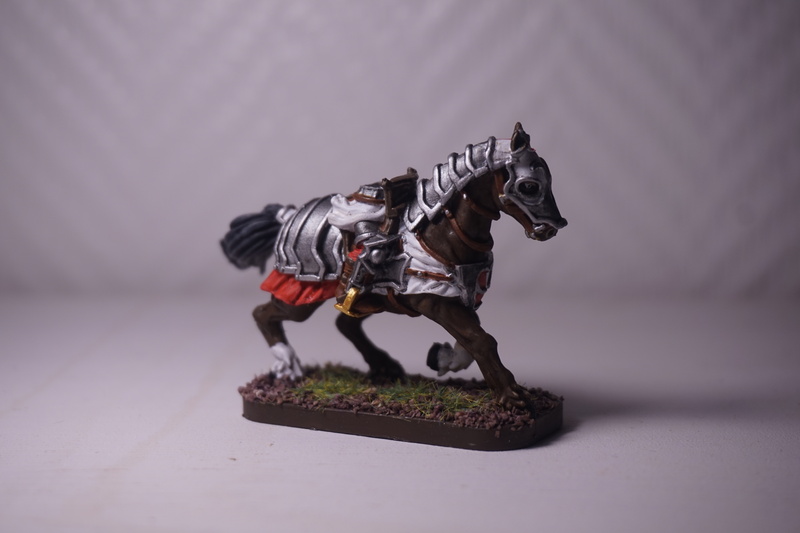 @QuickWhit your lancers are really nice, it's making me want to try a greyish theme like that as well. 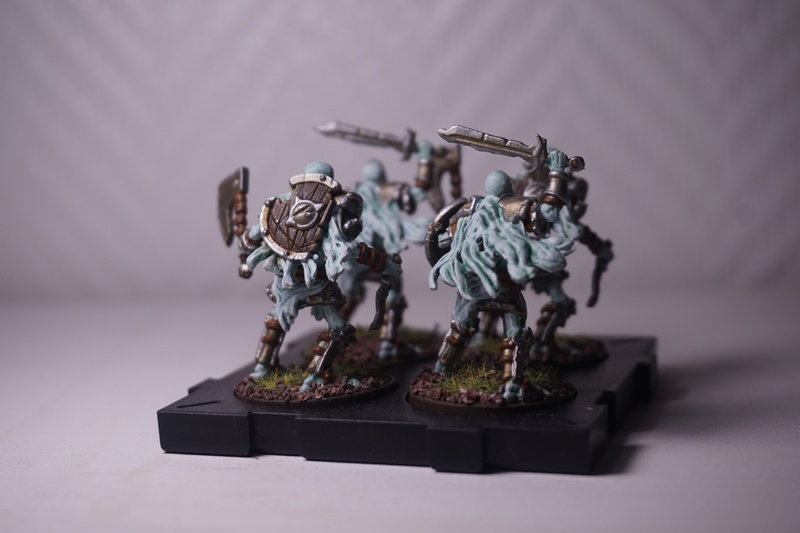 Though I don't think it'll be soon as I'll probably be doing a tray of Spearmen, both heroes and maybe the horses before - I live in a small flat so I brush-prime most of my minis, but I'll need to spray the lancer and haven't had the chance yet. 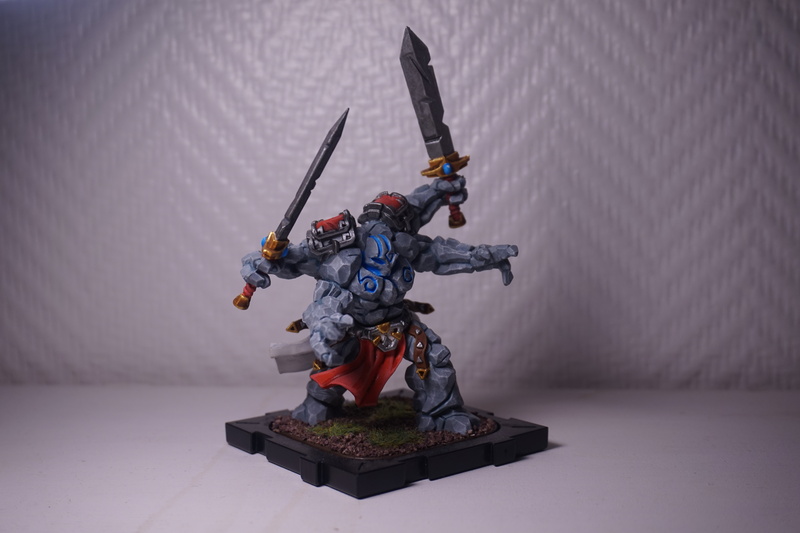 Anyway, here's this weekend's projet, Ardus Ix'Erebus! 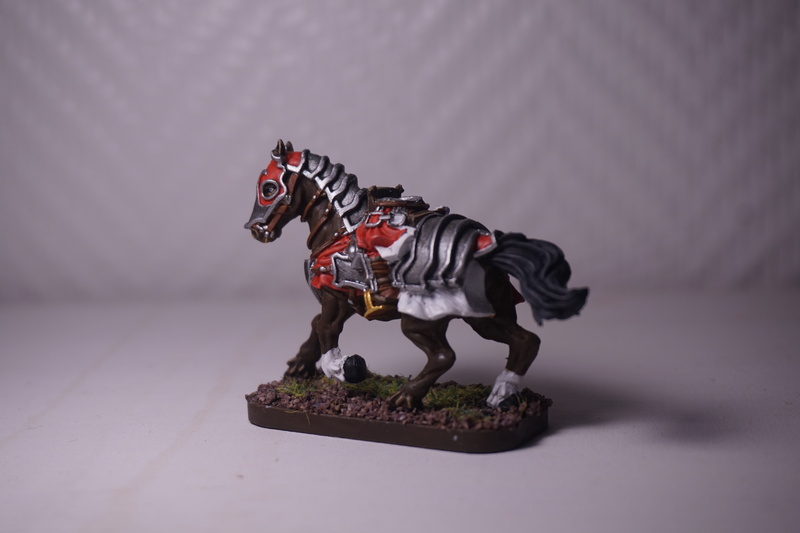 Bit of a half-assed job with the brown wash unfortunately, I diluted it a bit compared to my other Reanimates as I didn't want the armour to be quite as dirty, but I must have put too much as it has pooled in some places in a weird pinkish grey colour. 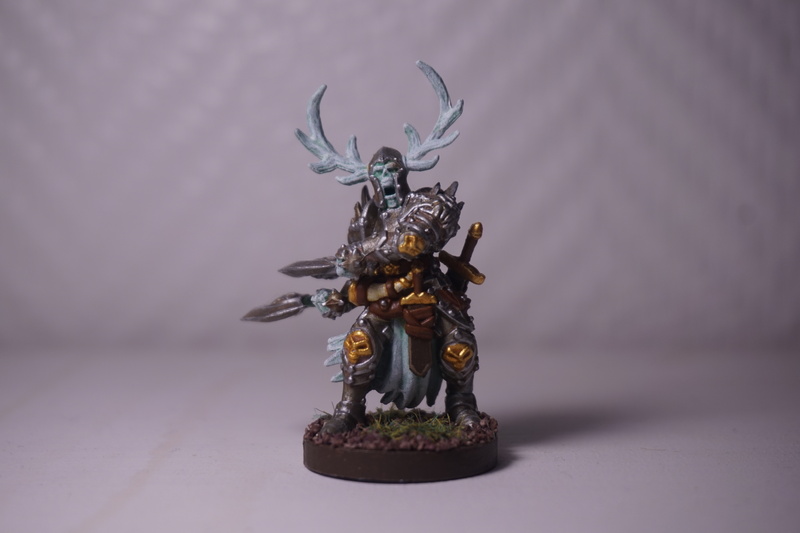 I'm happy with the green handles on the axes however, I'll probably paint my Death Knights in a very similar scheme. 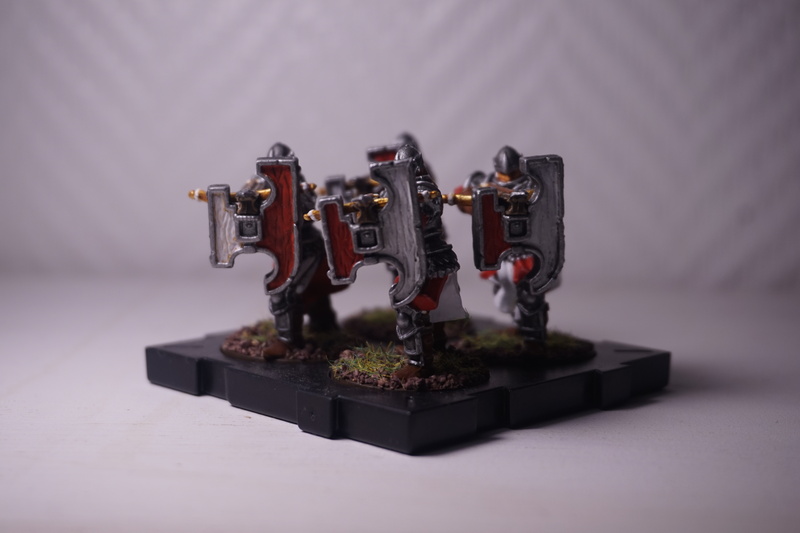 In the background as you can see I'm working on some Spearmen. 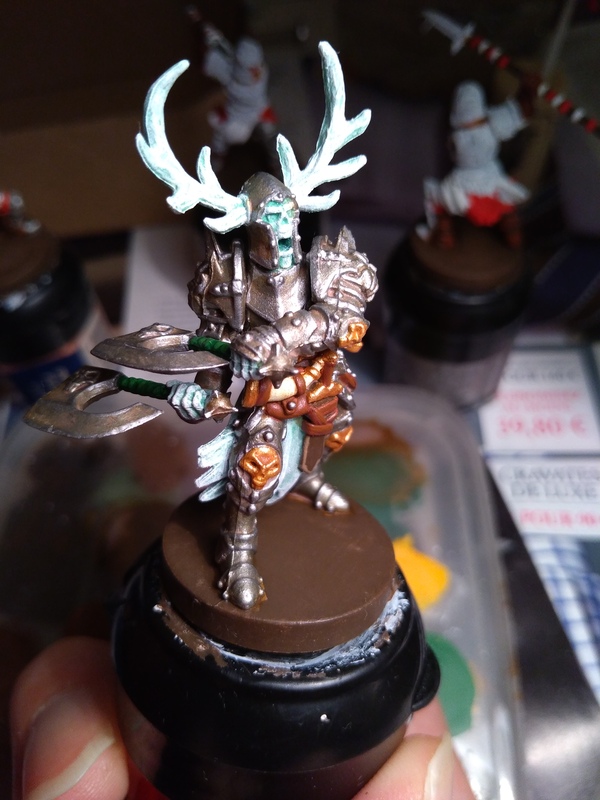 I don't know if this is what you're going for, but by using the ghostly blue-white on the antlers, it gives the appearance that those are connected to Ardus' skull, rather than being attachments to his armor, but I honestly think that makes him look really cool! Oh yeah that was totally the idea. Wait, are they *not* supposed to be connected to his skull normally? I just assumed they were some kind of unholy protuberance. 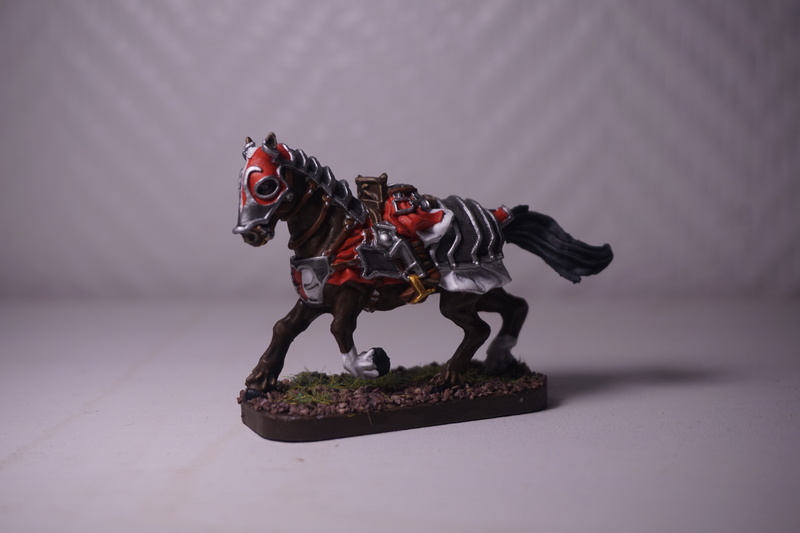 Update, some better pictures and the first two horses. Next will be the riders, Spearmen, and Kari. They are really good! 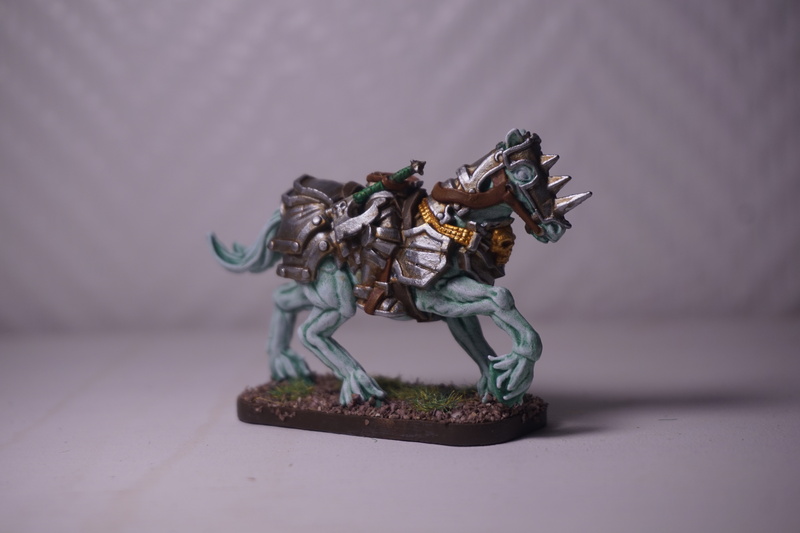 Especially the ghost horses, they are...perfect!